We are all in Kuching Sarawak right now prior to the WEC 2010 (the World Engineering Congress 2010). Lepak2 kat McD airport Kuching sebelum dibenarkan check-in.. While I’m in duty presenting my paper (well..ehm..for the sake of KPI actually..keh keh..1st paper beb..takut! ), I officially appointed Ayah (of course la..sape suh nk beriya2 ikut) to take care of Iman; which will be the first precious moment ever Iman with Ayah alone without me at their side. All these times, he always have Mama or Ibu helping him out whenever I’m not around. It is quite funny to hear how Ayah excitedly reporting every single thing he did together with Iman. Changing her diapers, put her to sleep, feed her up (with EBM or course). 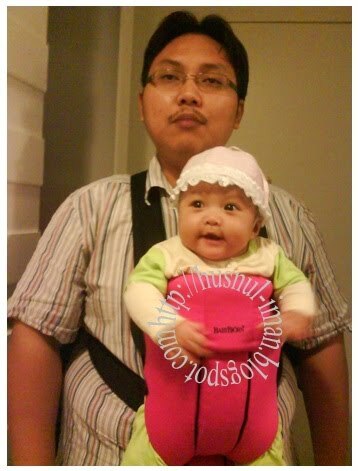 Iman is quite fussy with Ayah. 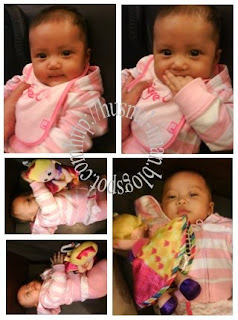 She wanted tonnes of concentrations and refuse to play alone (bukan x nak..da bosan main sendiri). 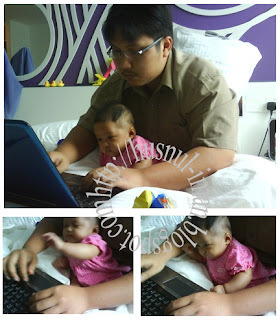 So Ayah cannot concentrate on his IM works when Iman is awake. 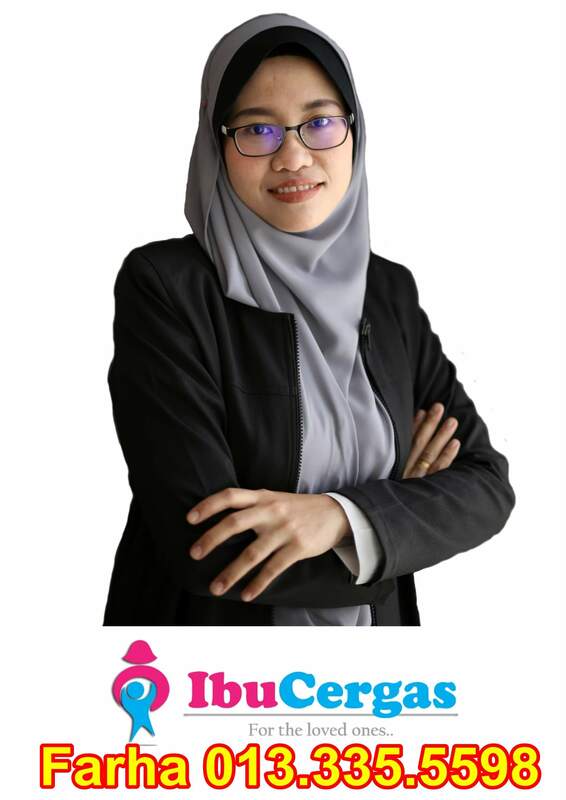 Beginilah caranya ye tuan-tuan..inilah skill beliau menidurkan anak kerana tak tahu mcm mana lagi caranya..huahahah…oh, buaian bayi is a no-no ok? 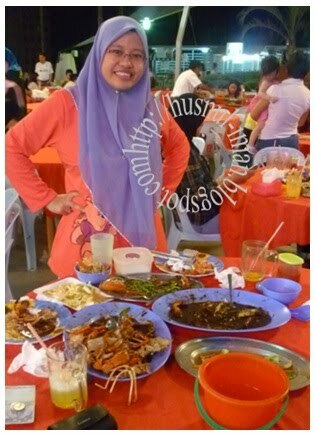 Okla.. to appreciate Ayah’s effort, I treat him seafood where they serve very big prawns here. Once I stepped into the restaurant, I though that the restaurant did not provide halal food, since there are a lot of Chinese words here and there. However, the workers there managed to convince us on the “halal”ness of the food beside there are a lot of certificates stamped by JAKIM on that. 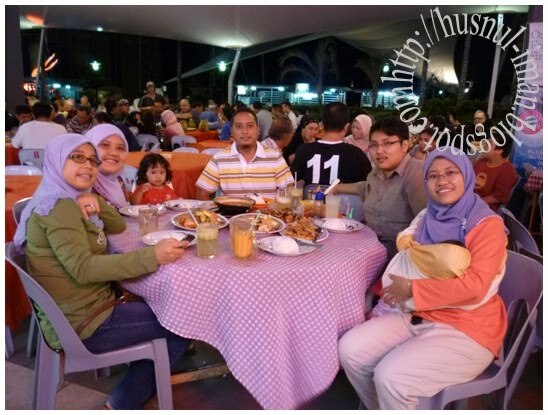 Ayah who very excited to try the seafood, googgled that they are confirmed halal (at least no was2 for me), so we proceed to eat there. 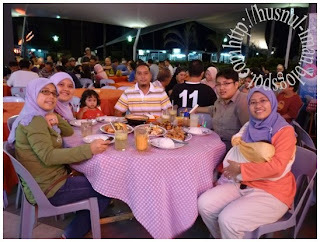 At first, we went there all together with Kak Sida and Kak Yan. 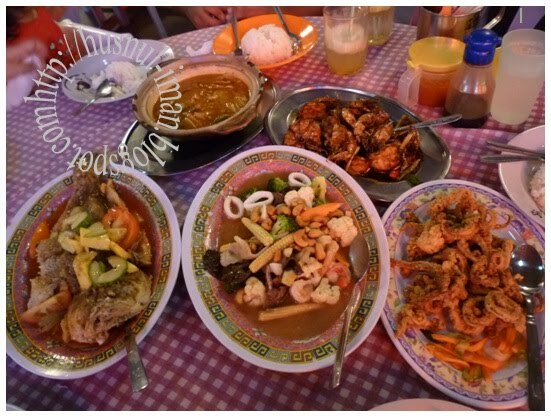 Erm…RM120 for 5..ok la kan…Udang Masak black-pepper tu sedap~!! Drooling over on the big prawns ad crabs, we decided to have another dinner the next night. (Segan nk makan yg besar2 saiznyer tu depan Kak Sida and Kak Yan…muahaha) Their big prawn, which worth RM65 per kg! 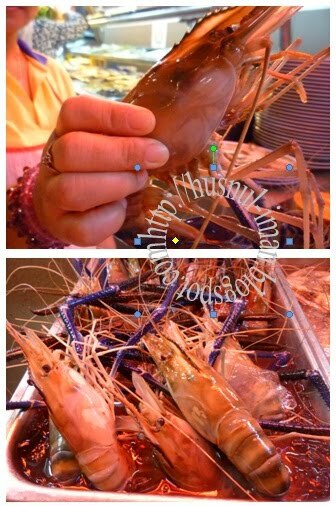 and each kg only merely consist of around 4 (only..sigh) prawns… huhuh..tak pela, since we are already here. 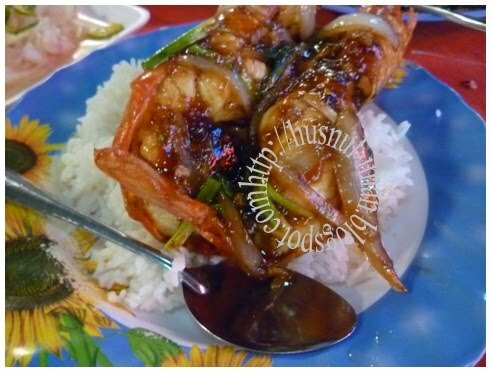 (tiba-tiba teringat Mee Udang Sg. Dua Penang la pulak..yummy). 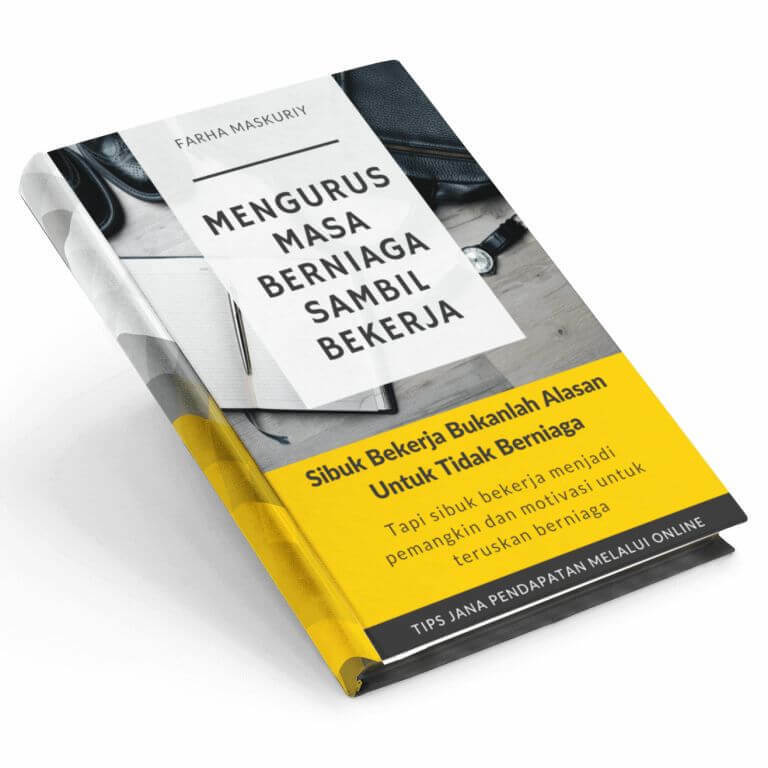 Saya masih kurus ok..Mr. Suami yang makan banya ok..